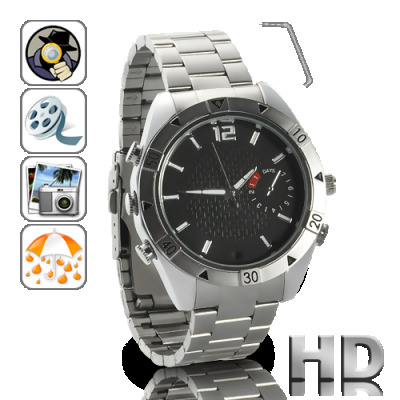 Successfully Added 2O - Waterproof HD Camera Watch with AV Out (4GB) to your Shopping Cart. The ultimate undercover and underwater gadget is here. Featuring 720p high definition video recording, high resolution photo captures, and a durable all-metal waterproof design, the 2O Waterproof HD Camera Watch with AV Out (4GB) has it all! This amazing Camera Watch takes 30 frames per second videos in the in 720P high definition AVI format! Along with the HD video resolution, this camera also takes 1600 x 1200 pixel resolution photos (which is an astounding 2 megapixels) and crisp audio at 192kb/s. It It also comes with 4GB internal flash memory so you will have enough storage capacity to capture hours of high quality video, audio, and pictures. But there's more! Recording on the Camera Watch as easy as wearing it. Power on the watch then presses the record button. It’s just that easy! Even better, to view your recordings simply connect the watch to your PC or laptop with the USB included then drags the files from the watch to your desktop. Not convenient enough? Then just connect it to your TV (or other AV-compatible monitor) with the AV cable for instant video playback! Full 720P HD video recording, an undetectable lens, and an ultra-durable waterproof design, this watch is a must-have addition to anybody's arsenal of gadgets - which makes it invaluable for your online store! Available in single piece or bulk orders, purchase a few today and start making some profit with yet another high quality device from Chinavasion.